Social neuroscience has called for new experimental paradigms aimed toward real-time interactions. A distinctive feature of interactions is mutual information exchange: One member of a pair changes in response to the other while simultaneously producing actions that alter the other. Combining mathematical and neurophysiological methods, we introduce a paradigm called the human dynamic clamp (HDC), to directly manipulate the interaction or coupling between a human and a surrogate constructed to behave like a human. Inspired by the dynamic clamp used so productively in cellular neuroscience, the HDC allows a person to interact in real time with a virtual partner itself driven by well-established models of coordination dynamics. 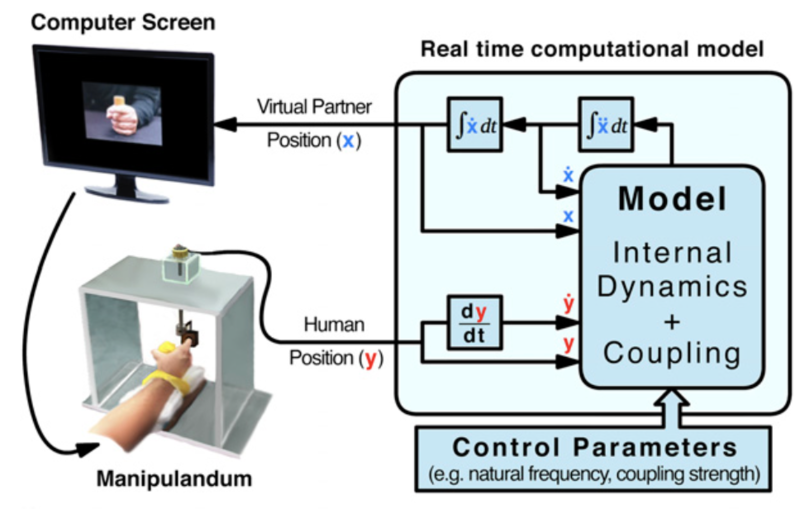 People coordinate hand movements with the visually observed movements of a virtual hand, the parameters of which depend on input from the subject’s own movements. We demonstrate that HDC can be extended to cover a broad repertoire of human behavior, including rhythmic and discrete movements, adaptation to changes of pacing, and behavioral skill learning as specified by a virtual “teacher.” We propose HDC as a general paradigm, best implemented when empirically verified theoretical or mathematical models have been developed in a particular scientific field. The HDC paradigm is powerful because it provides an opportunity to explore parameter ranges and perturbations that are not easily accessible in ordinary human interactions. The HDC not only enables to test the veracity of theoretical models, it also illuminates features that are not always apparent in real-time human social interactions and the brain correlates thereof.